Oh it's a happy Monday today. I have a LO to share today for Let's Get Sketchy. 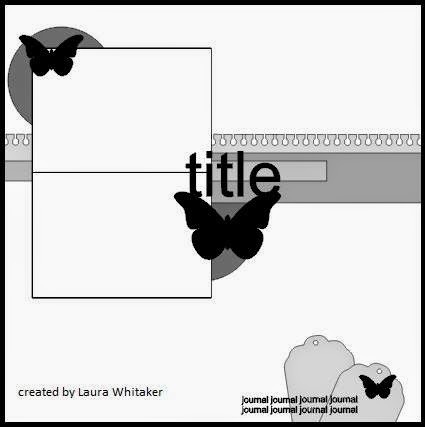 It features a cut file created for a new challenge blog, A Cutt Above. You can find and purchase this and many more creative cut files in A Cutt Above the Rest Etsy shop. I love photos of my boys with different expressions on their faces. I should probably edit more and use only one, but I knew here he didn't want to smile, but did anyway. I didn't stray much from the original design. I did use larger photos, and eliminated the circular elements. I kept the embellishments simple here because I wanted to feature the title "(Love) this face", from A Cutt Above. As always, thanks for taking a look at my creative view. Please go check out Let's Get Sketchy for more LO's created from this sketch. And if you have an electronic die cut machine, you'll want to bookmark and follow A Cutt Above.